Posted on February 2, 2012	by Linda S.
Hi.. I’m back for Part 3 of our tutorial for quilt making. Our quilt is now tied and is beginning to really look like a quilt. It’s time now for the binding of the edges. First, the edges must be trimmed to be straight. Since I was going to use the back fabric as the binding, I started trimming the top fabric and the batting to have a straight edge. The idea here is to then fold the backing once to firm up the edge of the fabric and then again over the batting and top fabric, sewing it in place and forming a self binding. As you can see from the photo, mistakes happen. They are not insurmountable. 1) If the cut had been a little closer to the edge, it’s possible that the first fold would encompass the cut and the second fold would not show it… alas, that was not the case here. 2) A separate binding could be made.. which is the case here. 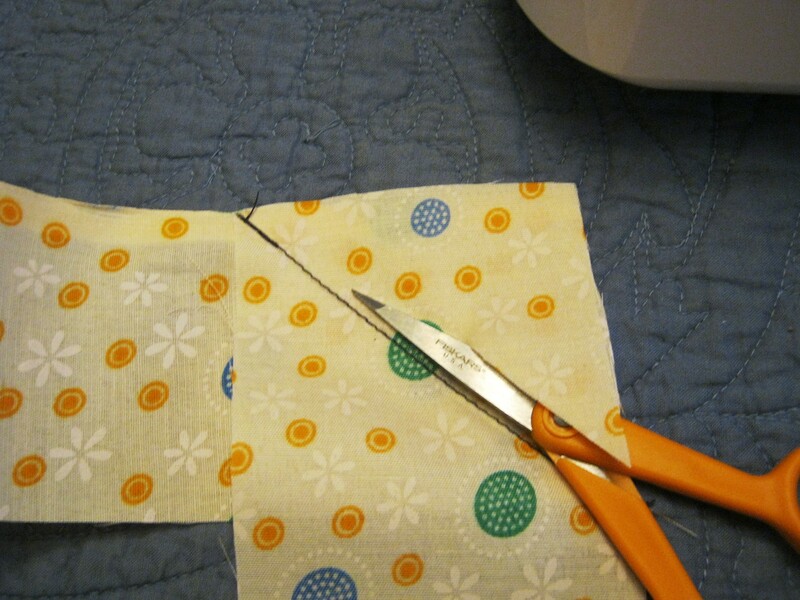 By sewing smaller pieces of fabric together with edges at a 90° angle, the seam will not make a huge bump on the finished binding. Place the two pieces together, right sides together, at a 90° angle and sew as shown above. Trim the seam back to about 1/4 to 1/2 inch. Straighten the fabric and press the seam one side. 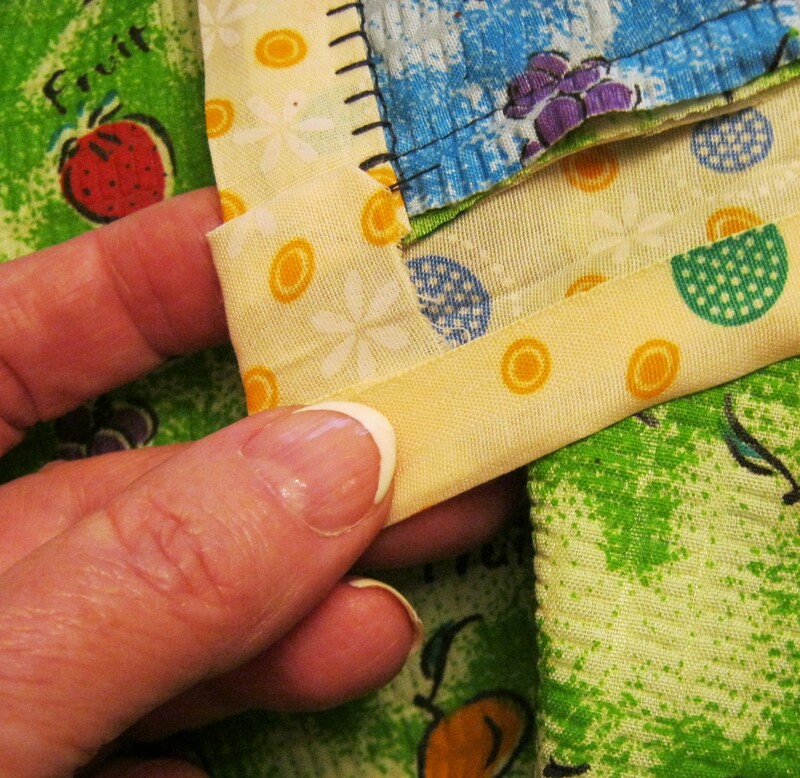 Continue sewing your binding pieces together until there is binding for all 4 sides. 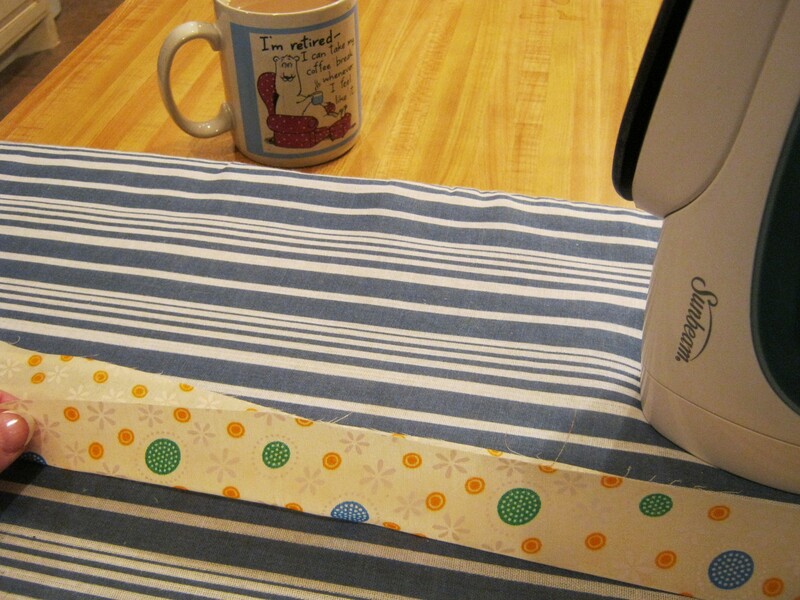 When your binding is complete, fold in half and press. I did not get photos of the next step, but now you lay it out flat, fold the top to the center fold and bottom to the center and press. You now have your binding. Now back to the quilt. 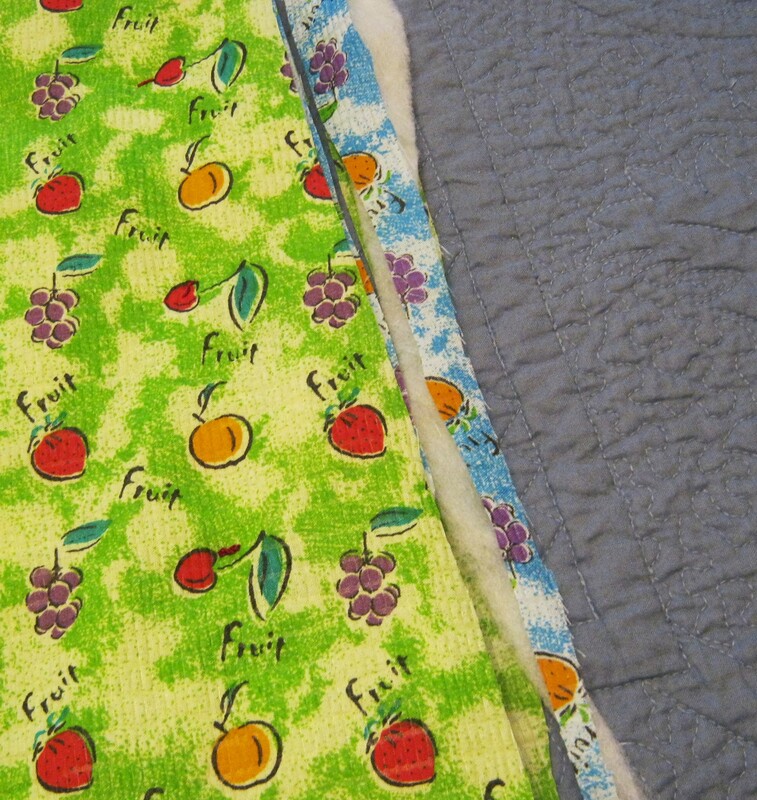 Trim through all thicknesses of the quilt to straighten all edges of your quilt. 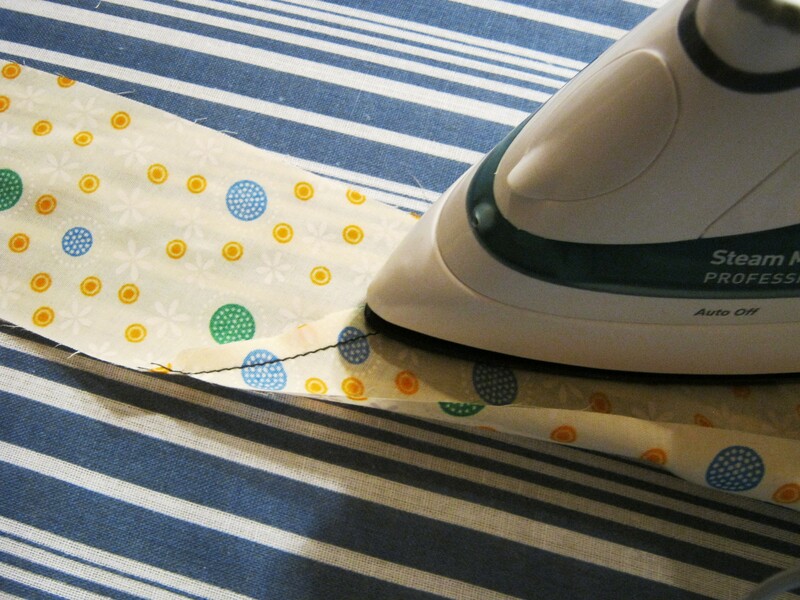 Lay out your binding on the BACK of your quilt with the seamline to be at the fold as shown in the photo. 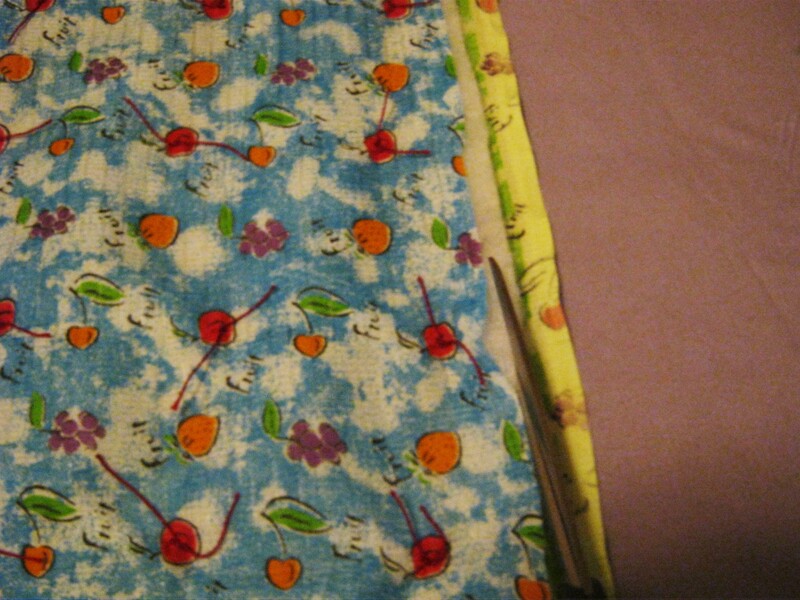 I sewed each side separately, sewing the long sides first and having NO OVERHANG ON THE ENDS. Then I sewed the short sides. 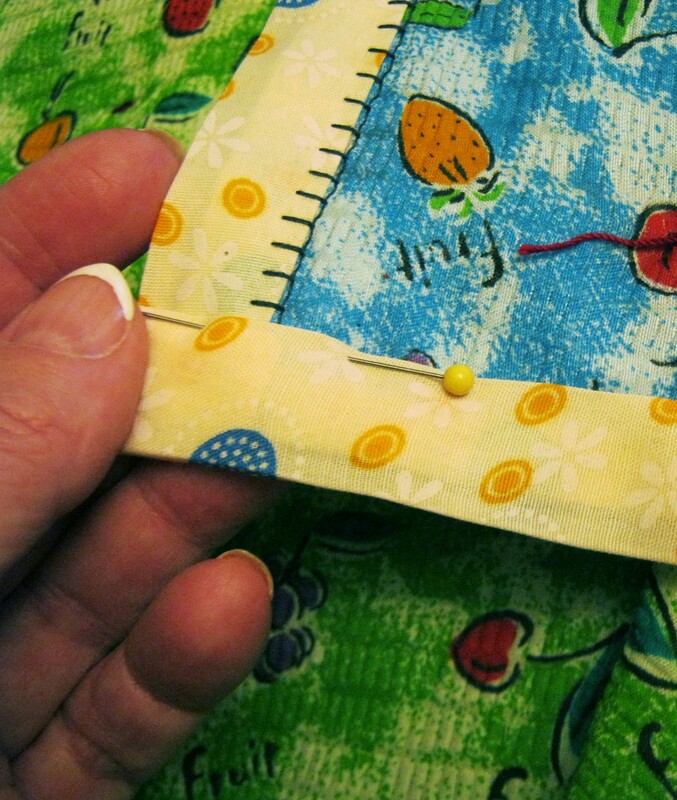 Before you start sewing, please see the photos coming up of how to pin your binding at the edges of the short side of the quilt. 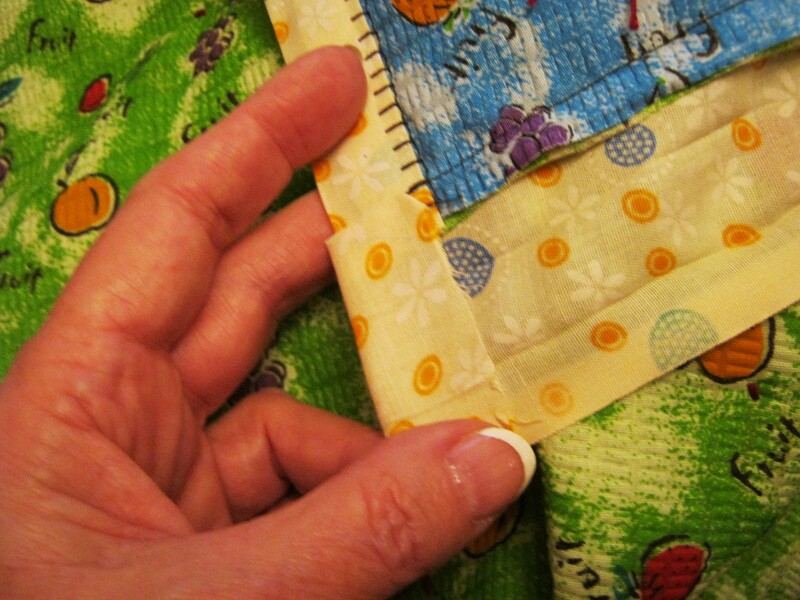 Before you begin to sew, make sure you line up your binding edge with the edge of the quilt and pin it well. Now you can sew the long sides. The short sides, however, have fabric left over at each end. This is to cover the raw edges of the binding left by the binding sewn on the long sides. (I surely hope this makes sense..lol) When you position your binding for the short sides, be sure to leave about 1/2 inch of fabric overlap on each end. This fabric is folded over the edge of the quilt, pinned and will be sewn in that position. Be sure to line up the fold lines on the back side with the fold lines on the right side. 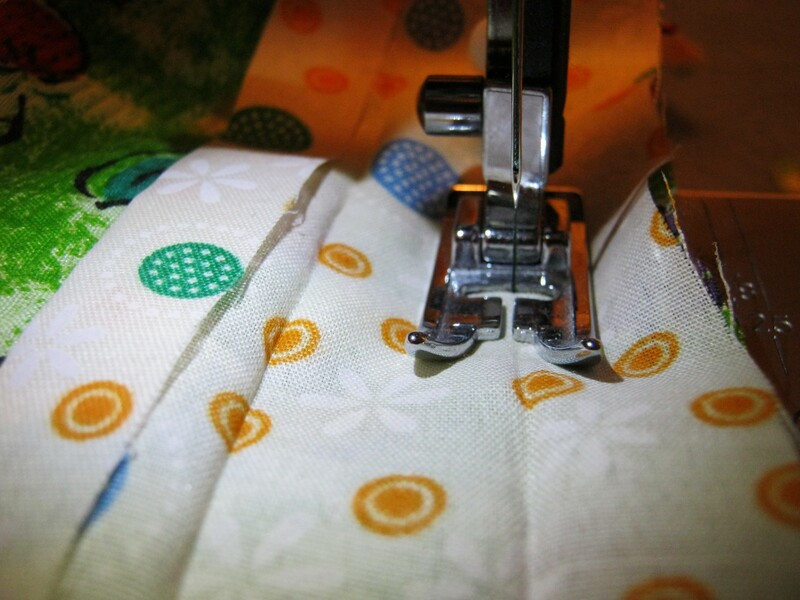 Now sew the binding on, following the fold line as your seam line and continue to sew the folded end. 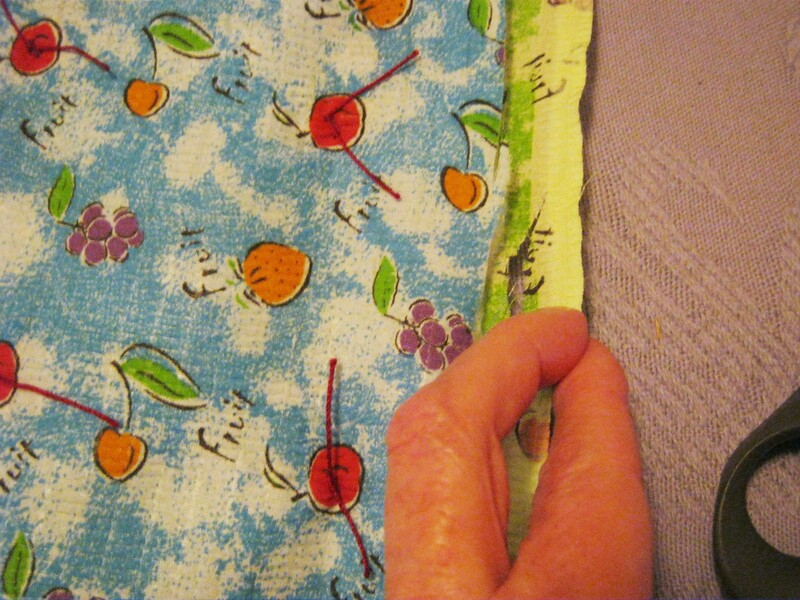 When this seam is sewn, turn the quilt over and fold the binding out with the corner turned to the front as shown in the photo. Now fold over the first fold. Now fold one more time and your binding is ready to be sewn in place. 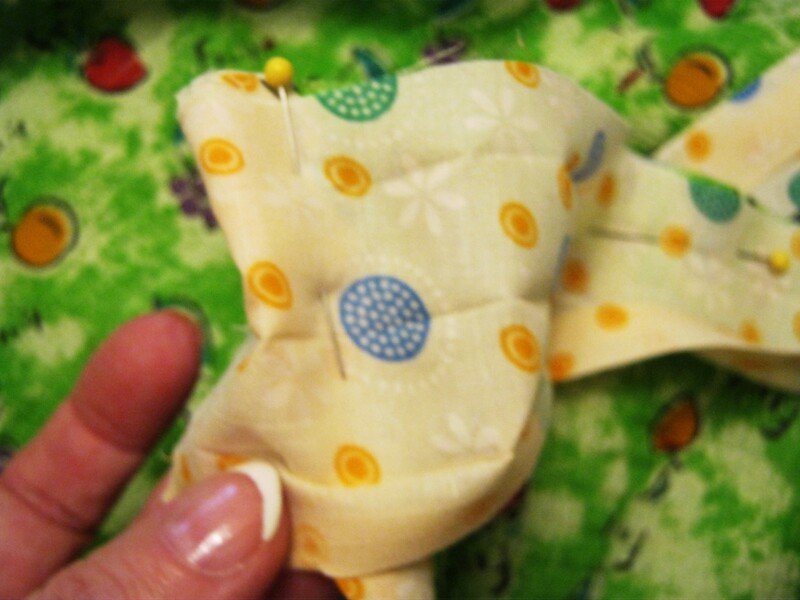 Do this for each end of the short side binding and sew each seam. You’ll notice that I used a buttonhole stitch for the top seam of my binding. This is only a personal preference. 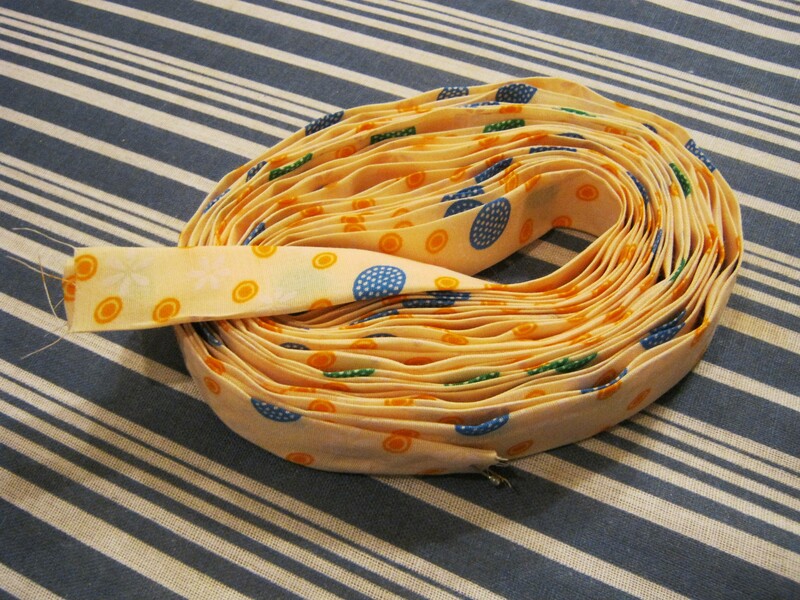 You can sew it using a straight seam close to the edge of the binding… or use any stitch that you think would look nice. If you want your stitches not to show on the top side, then use a needle and thread and hand sew it using a blind stitch. And you are FINISHED! 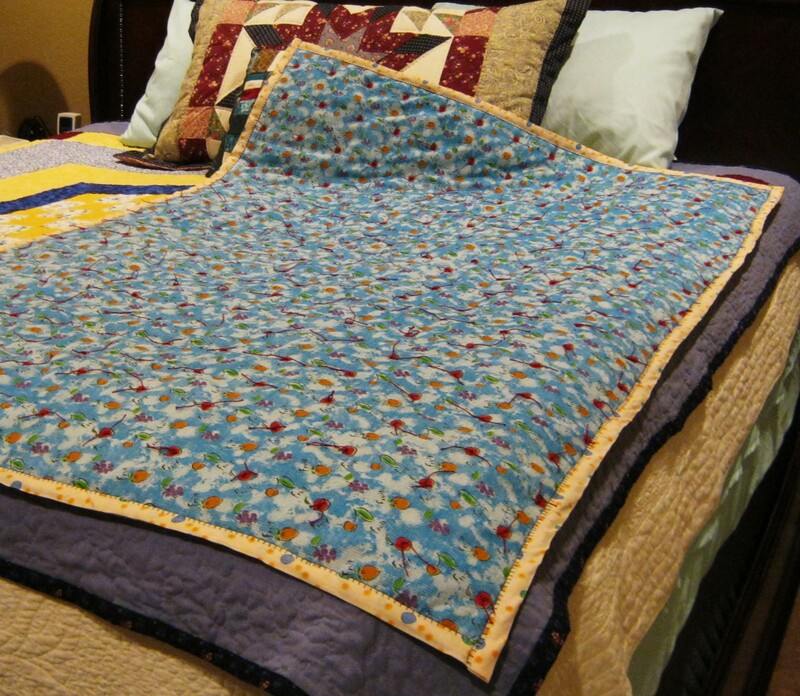 These quilts can be made in a week-end. All other quilts are just variations of this quilt. The top can be sewn in squares that are pretty colors. The blocks may be pieced to make pretty pattern, embroidered, appliqued, pieced and cut to be resewn to make a completely different pattern… you can do whatever you want. But all are still just a basic quilt and are finished the same way this quilt was made. This entry was posted in Crafts, Free Patterns, Handcraft, Handwork, Historical Textile, Needlework, Quilt, Sewing, Tutorials and tagged craft, crafting, Crafts, create, Free Patterns, handmade, Handwork, patterns, quilts, Sewing, tutorial. Bookmark the permalink. I do my quilting mostly in hand quilt and i’m using fancy stitches using yarn or embroidery thread to make my quilt artful. but i will try this …hope i can make quilt as well done as this. thanks Linda for this post. The blanket stitch on the binding is very cool. Will have to try that if I ever finish another quilt.